I’m quite active in several bead/jewellery design groups on Facebook. A couple of months ago, one of those groups, Creative Bead Chat, had a big giveaway competition to celebrate reaching 2000 members. Of course, I put my name down for pretty much every prize offered! 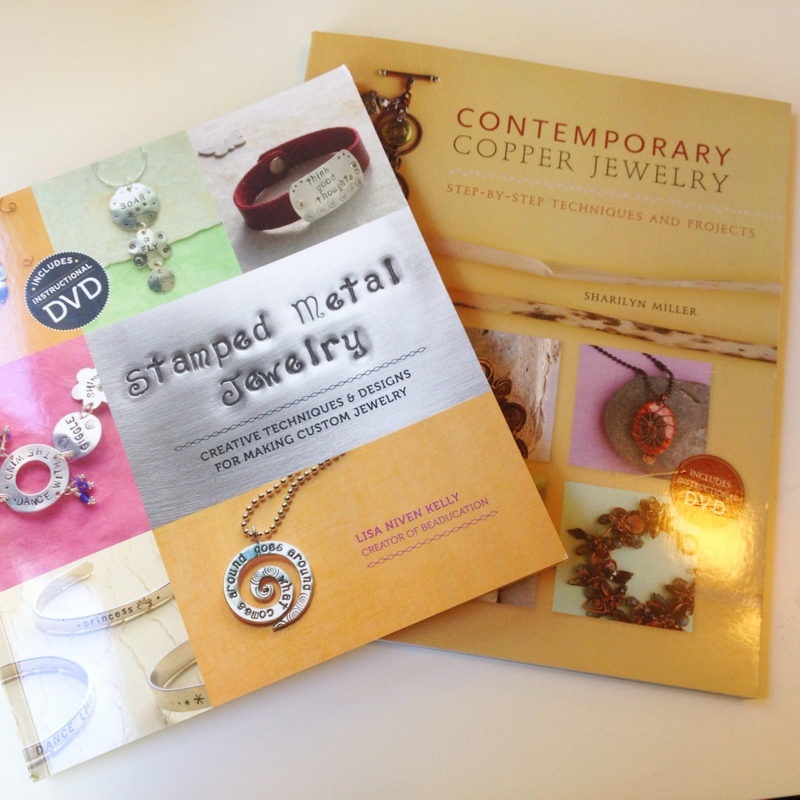 And to my surprise I won a book donated by Tammy Jones, the editor of Jewelry Making Daily, the online presence of publishing company Interweave’s Jewelry division. Not only that, but Tammy actually sent me two books! Here are the books I received. 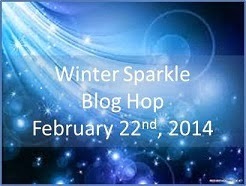 I have to say, they are both fabulous, with some wonderful ideas for projects! 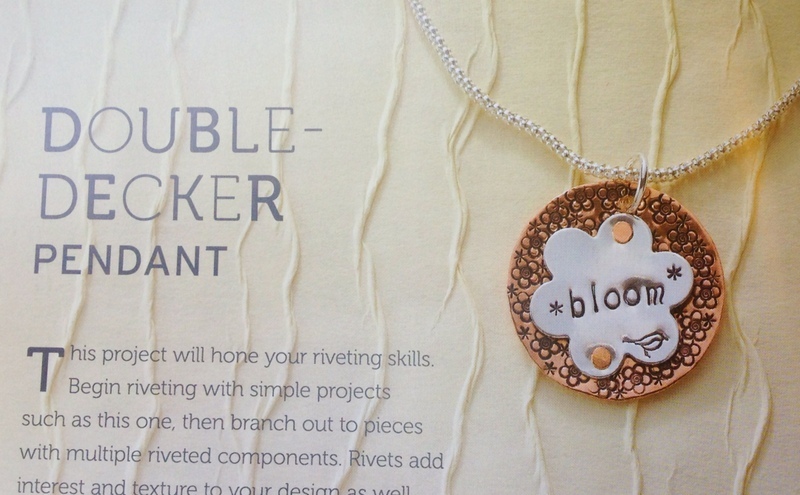 I took a quick photo of a couple of the projects I’d like to do when I have some time (and the right tools too, metal stamps are definitely on my Christmas wishlist this year). To save on postage, the books were sent to my parent’s holiday place in Colorado, and as they have only just returned from their annual US trip, I have only just received them. Thanks Dad for carting them from Denver to Buffalo and then all the way back to Melbourne, it’s much appreciated! Needless to say I have not had much time to look through them, let alone attempt one of the projects! 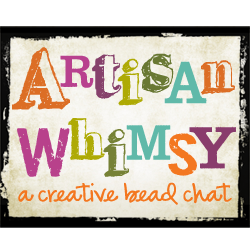 But I thought I would take the time to say a big thank you to Tammy Jones, as well as to the Creative Bead Chat/Artisan Whimsy community, ably run by Melinda Orr, Marla James, Natalie McKenna, Cynthia Machata and Linda Younkman! Now, if I only had time to sit down and play! 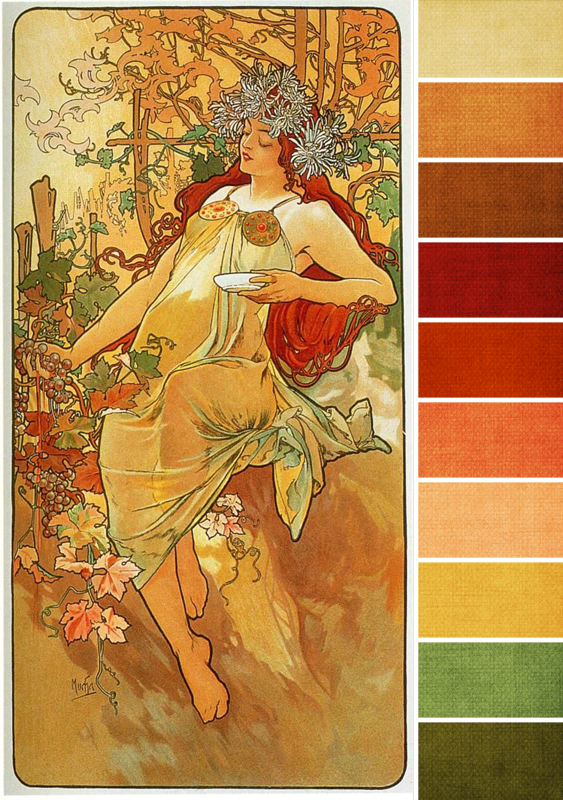 This month’s Art Bead Scene Challenge inspiration picture was the irresistible Autumn by Alphonse Mucha. 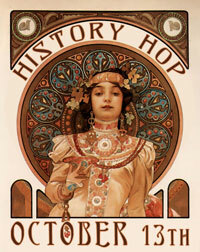 Mucha’s Art Nouveau illustrations are among my favourites, I love the sinuous flowing lines and nature inspired themes. This particular painting, one of a series representing the four seasons, is largely in shades of russet, orange and yellow, with little pops of green and dark browns. A very autumnal palette! I used the colours in the illustration as my inspiration for this bracelet. Last year I took part in a gift exchange and one of the gifts I received was a set of beads by Tennessee-based lampworker Marie Sawyer, which just happen to be in similar swirly patterns of pinky oranges and browns. 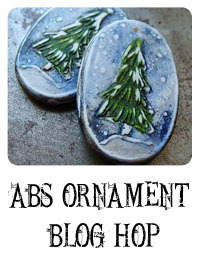 I paired three of them with some green Czech glass beads and a green maple leaf. The clasp echoes the vine tendrils in the illustration. I also made some earrings with the leftover pair of beads. 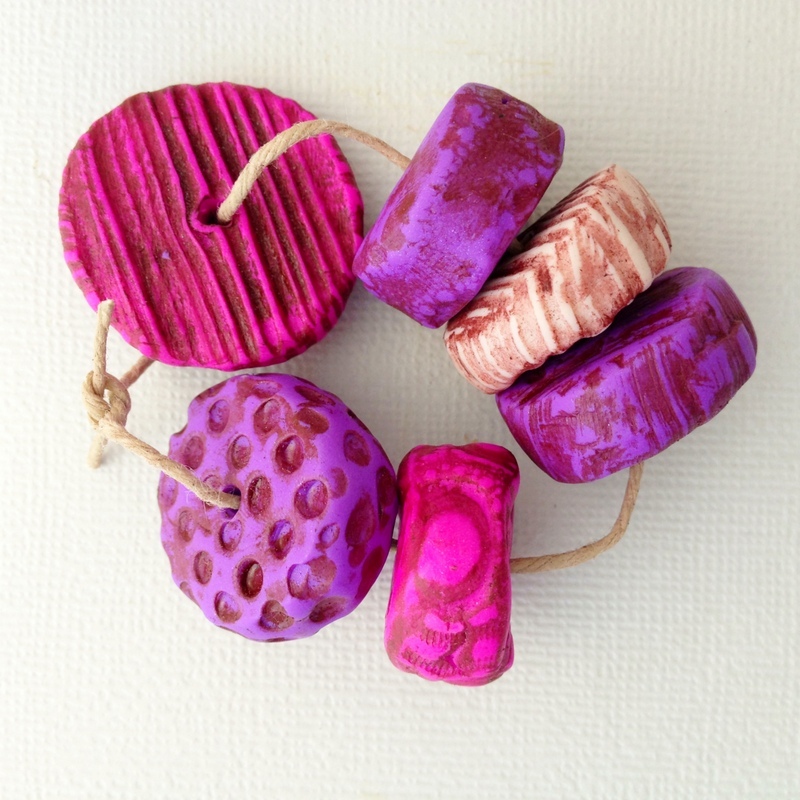 A little while ago, Kristi Bowman decided to hold a blog hop to see what jewellery designers might want to do with her new “wonky beads“—big fat chunky polymer clay beads in vibrant colours and textures. I jumped right in and ordered the Fuschia colourway. 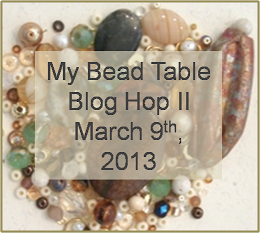 When the beads arrived I was thrilled with them, they are such vibrant silky colours! It took me a while to decide what to do with the beads, as they are much larger than I usually play with, and I was unsure what to pair them with. 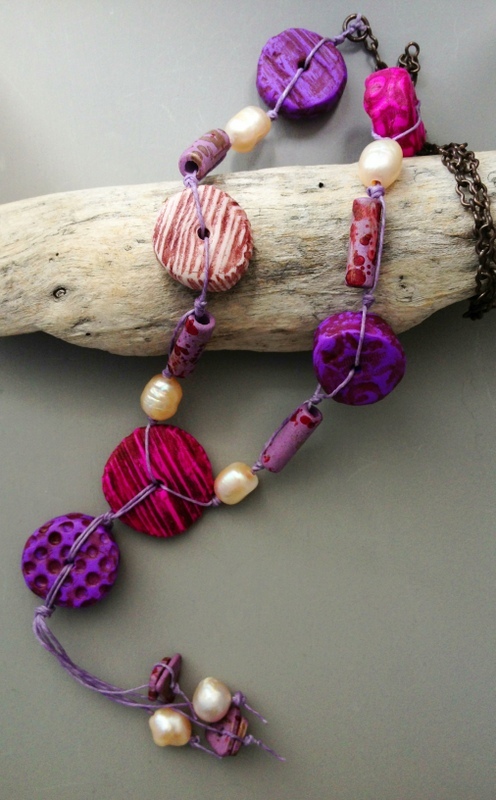 In the end, I pulled out some ivory large hole pearls in similar hues to the single ivory wonky bead, and found a bag of purple Greek ceramic beads with magenta and gold splotches (technical term, that one! 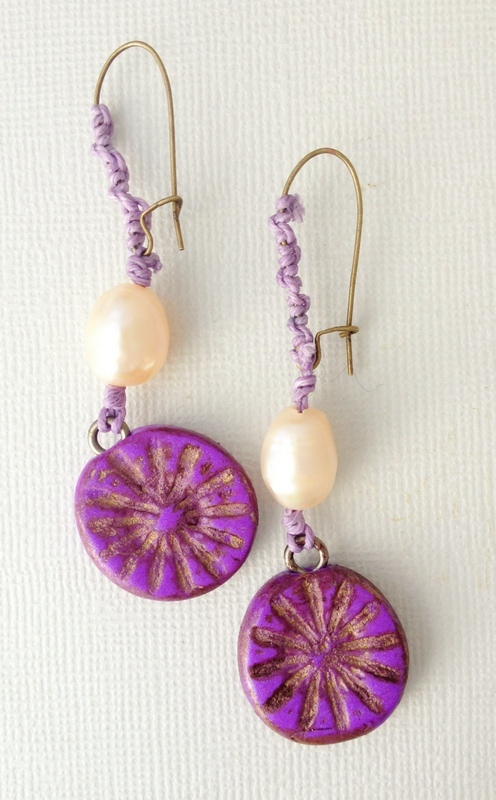 ), as well as some lavender waxed linen cord and antique brass chain. 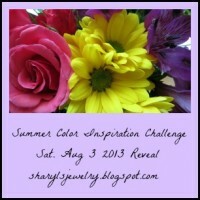 While I was in Kristi’s shop, I also picked up a pair of flower charms in the same shade of purple. I knotted them to a pearl and then continued to knot the linen up the front of the brass earring wire, twisting it around as I went. I’m really happy with how this set turned out, think I might keep them for myself! 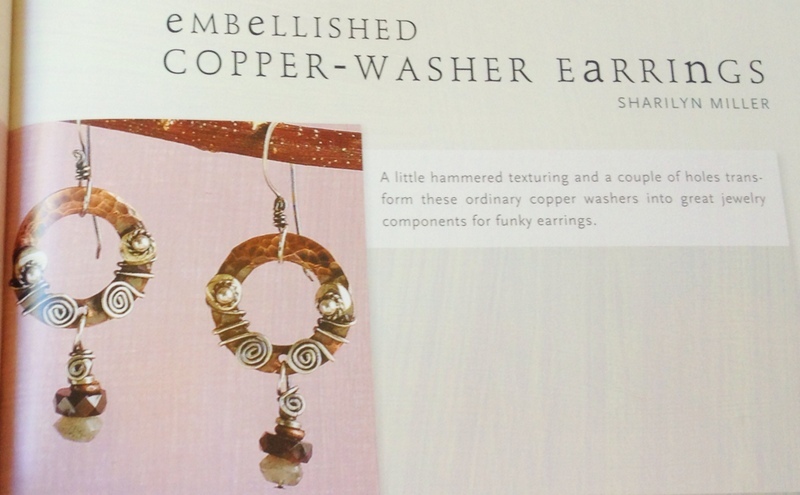 Thanks again Kristi for the opportunity to play with your funky wonky beads! 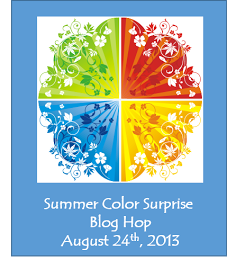 There are other participants in the blog hop, please go and have a look at their creations on Kristi’s blog, or hopefully by clicking on the links below! 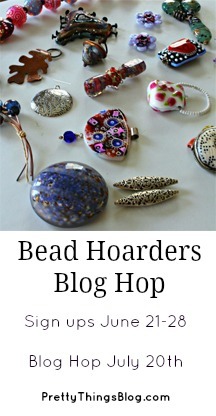 I’m taking part in a few artisan-bead blog hops in the near future, one in about a week using Kristi Bowman‘s Wonky Beads, and another in early October with a collections of beads from UK artists Lesley Watts (THEA Elements) and Caroline Dewison (BlueberriBeads). 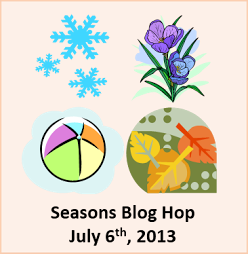 The idea is to feature their beads in some creations to be revealed during the blog hops. 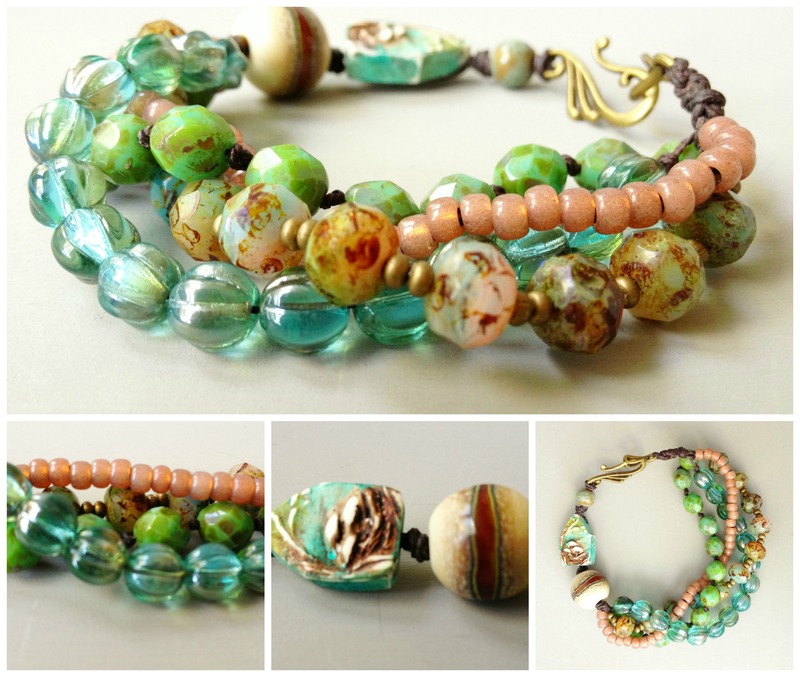 Here are the wonky beads from Kristi — I selected the colourway and she chose a set for me. 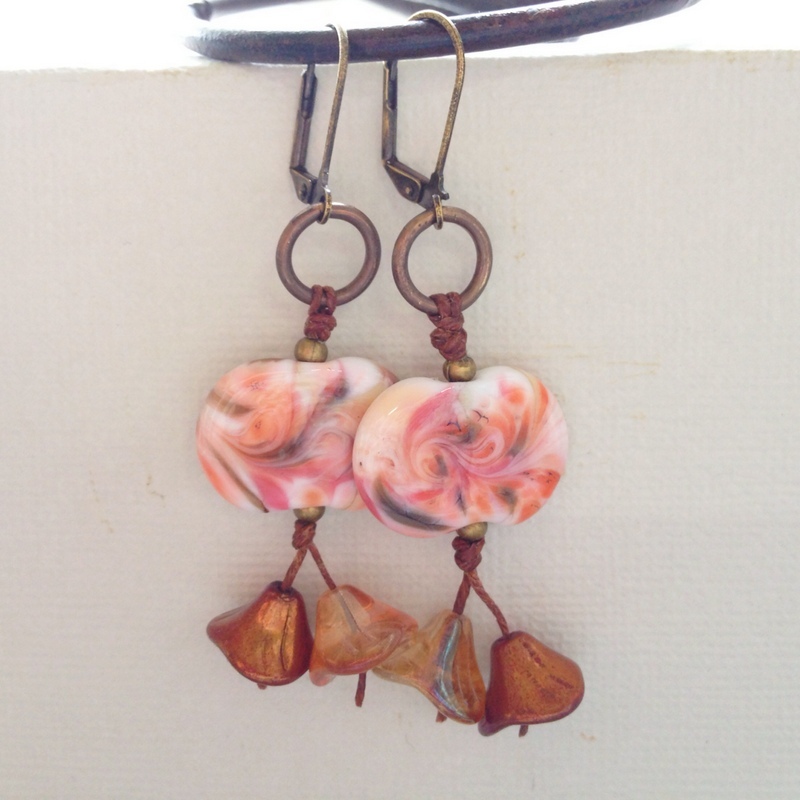 They are the most delicious colours and because they’re polymer clay, they are very light despite being quite large. And here are the beads and components I got from Lesley and Caroline’s bag of goodies. 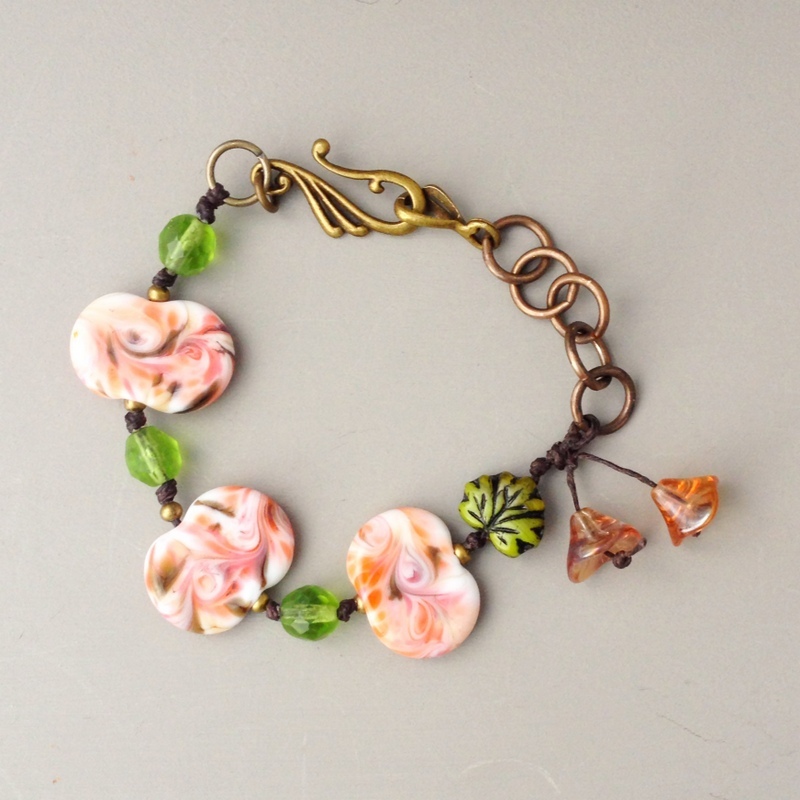 Lesley provided a bracelet focal and a pendant , both made from bronze clay. The bracelet focal has been coloured with a deep magenta-pink patina, while the flower has a purple enamel centre. 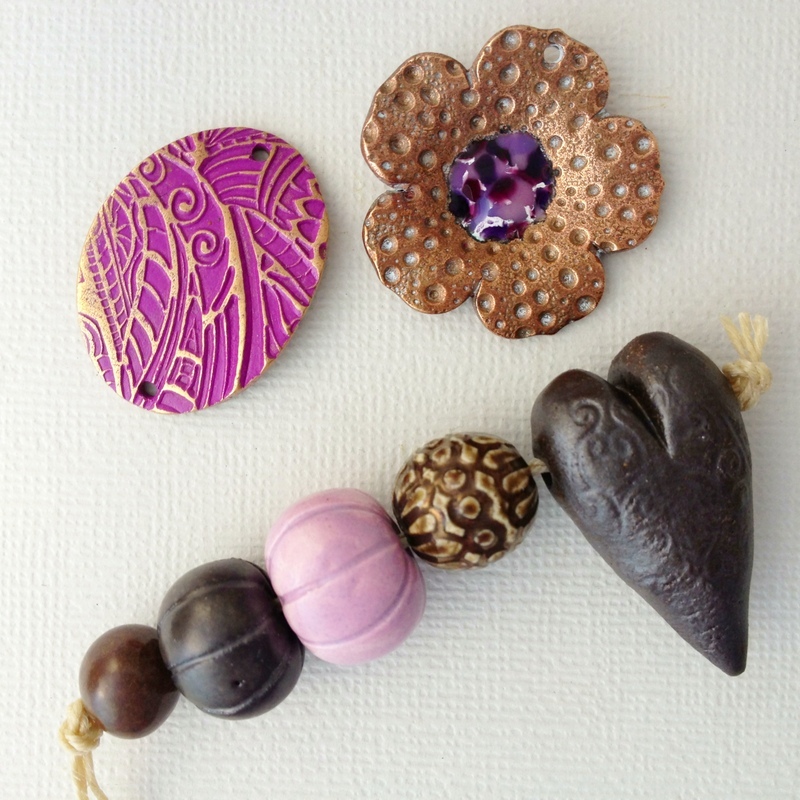 Caroline has provided a selection of ceramic beads, topped off with a heart in a dark chocolate brown. 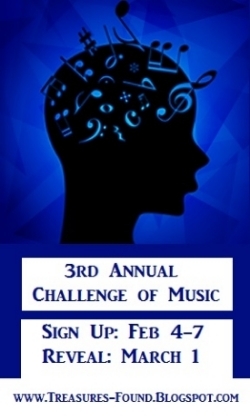 The ideas are swirling around in my head! 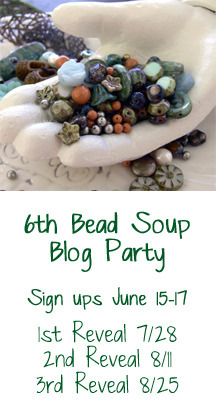 Come back next weekend to see what I make with Kristi’s beads in the Wonky Bead Blog Hop, and on October 2nd for the Autumn Design Challenge. Welcome to Melbourne … as seen by me. 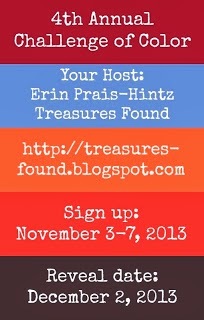 Today’s blog is the reveal of the 2nd Annual Challenge of Travel blog hop, hosted by Erin Prais-Hintz. Erin had the delightful idea of writing about our hometowns in this year’s Challenge—a “stay-cation” if you will. So let me tell you about my hometown. Melbourne is not my original hometown—I grew up in Perth, on the other side of Australia—but I have always have had family here, and when my husband and I moved back to Australia over ten years ago, we chose Melbourne as our place to settle down. 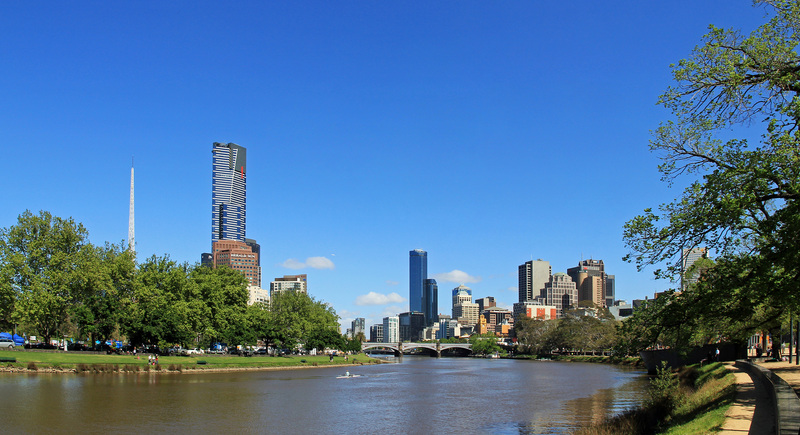 Melbourne is the capital city of Victoria, one of the six Australian states. It’s Australia’s second largest city, with a population of more than 4 million. It was founded in 1835 and, after the discovery of gold in Victoria in the 1850s, became one of the richest cities in the world (sadly nowadays, it’s one of the most expensive cities in the world to live in, despite its title as the most liveable city). Nowadays, Melbourne is a vibrant city, known more for its culture and addiction to sports of all kinds (tennis, cricket, motor sports, and especially Aussie Rules Football, locally known as the footy), than its looks. It has a moderate climate, warm to hot in the summer, and cool in the winter, and we frequently experience “four seasons in one day” thanks to the cold waters of the Southern Ocean below us and the heat of inland Australia above. It’s one of Australia’s leafiest cities, thanks to both the climate and the English influence, and there are beautiful parks in all corners of the metropolitan area. But what I like best about Melbourne is its ambiance. Generations of migrants, starting with the British (convicts! ), the gold diggers of the mid-1800s including plenty of Chinese, German and Irish fortune seekers, post WWII immigration by southern Europeans, particularly from Italy and Greece, and more recently SE Asian, Middle-Eastern and African immigrants have made Melbourne home, resulting in a melting pot of multicultural influence, and the ability to find just about any kind of food you might desire! Our damp cold winters lend themselves to art and theatre, while our summers can be delightful. And every neighbourhood has its own personality. One of my favourite parts of Melbourne is St Kilda, where I lived for a few years. Down by the beach, it’s a magnet for tourists and backpackers, and a lively spot with lots of good cafes and restaurants, with vestiges of a seedy past that give it a bit of an edge. 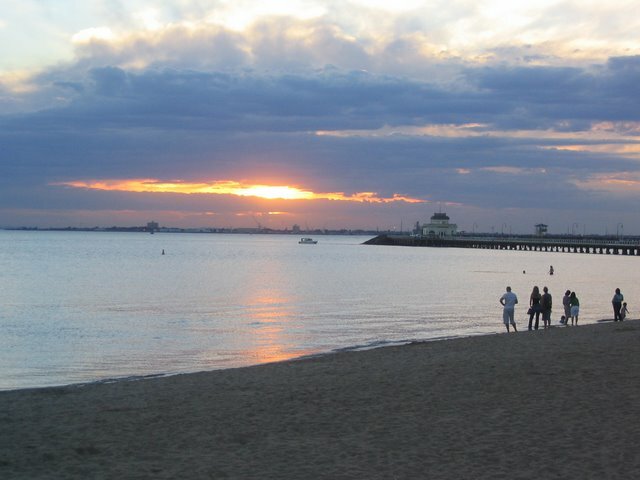 St Kilda Beach, on Port Phillip Bay, is no Bondi, but it has its charms, and is a fabulous spot for a walk. It’s also the home of Luna Park, an historic amusement park, and the inspiration for my first piece. 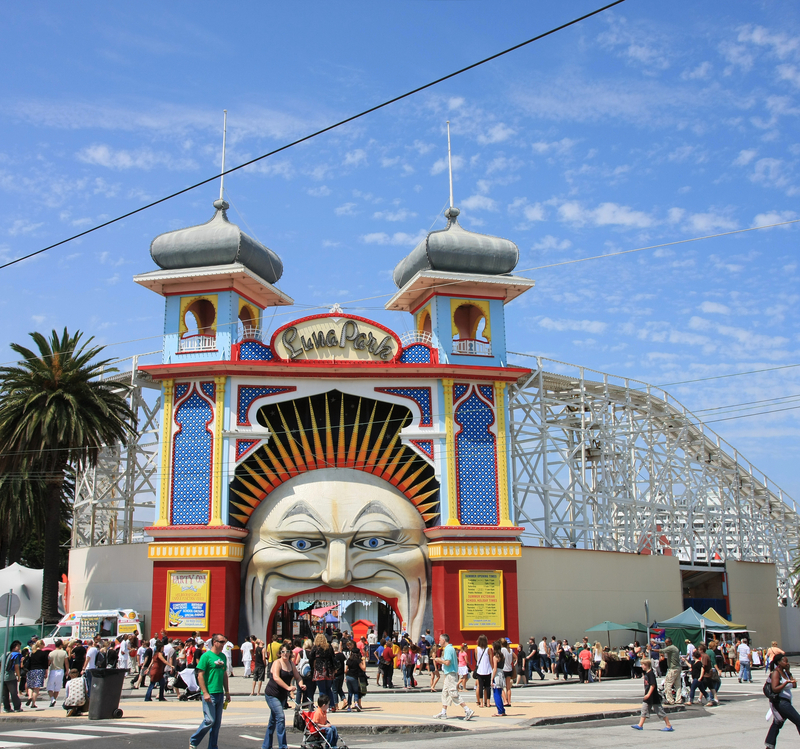 Luna Park was built in 1912, and has operated more or less continuously since then. Its Scenic Railway is the oldest continuously operating rollercoaster in the world. And its iconic “Mr Moon” facade is instantly recognisable. 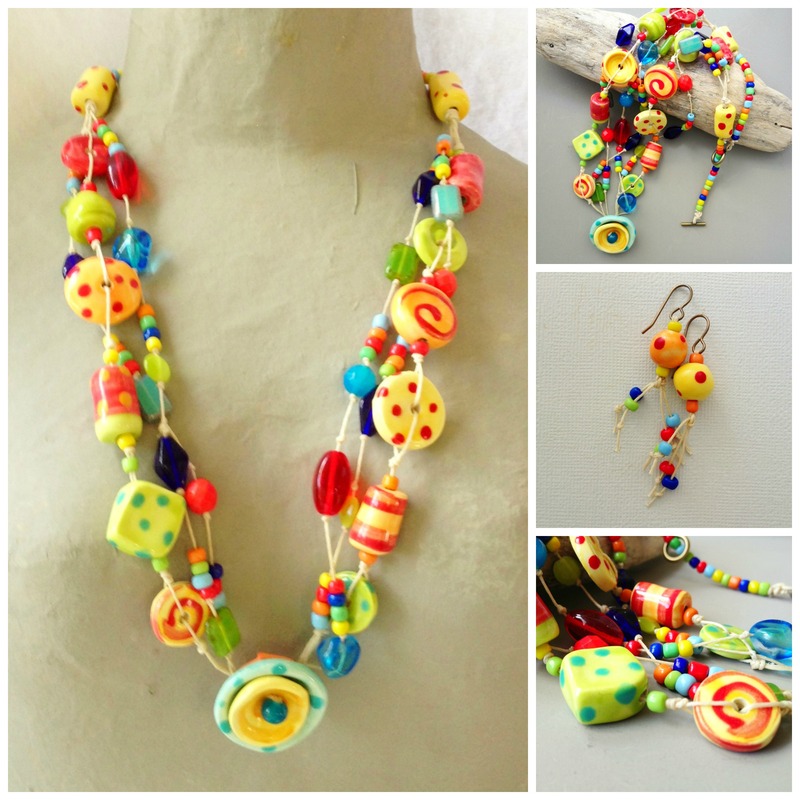 I used a fair chunk of my stash of bright happy beads by Jennifer “Jangles” Heynen to reflect the primary colours in the facade, and natural waxed linen inspired by the rollercoaster framework to make a fun necklace and a pair of (mis)matching earrings. My other piece was more inspired by the colours of Melbourne than a particular landmark. First of all, I’d like to note that this bracelet is heavily influenced by Lorelei Eurto, who regularly makes bracelets in this style. Thank you for the inspiration Lorelei (and my version is for personal use only). The Humblebeads birds nest house represents my home in Melbourne, and the other beads are inspired by the colours of Port Phillip Bay and its beaches, the Yarra River (notably a very muddy river), and the greens of Melbourne’s leafy vegetation. 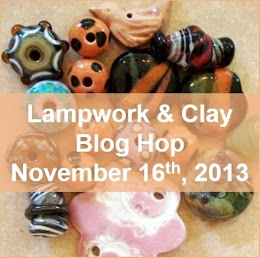 The big lampwork bead is by a local artist, Puddle Glass Art. I hope you have enjoyed my little introduction to Melbourne! 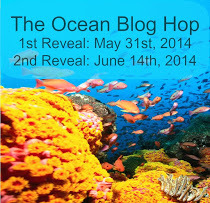 I’d have loved to take you further afield, but there’s a blog hop to get to! 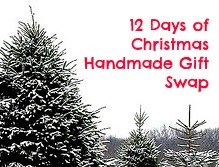 Erin has linked up all the participants on her blog post so mosey on over there and take a peek at some wonderful places.